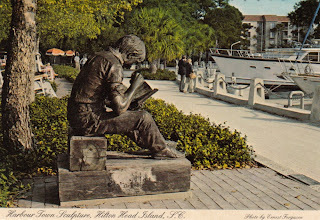 This is a photo of a postcard from Hilton Head Island, SC. 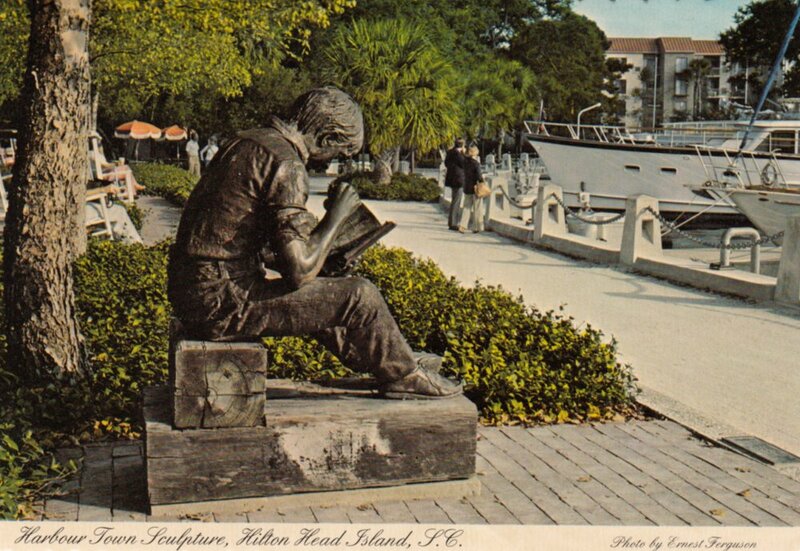 Nice Sculpture in their Harbor, called "Out to Lunch"
Okay, for folks interested in how fast I read, I took the time to clock my reading for a book. Her Royal Spyness by Rhys Bowen: this standard paperback book is 324 pages. I started it at 12:50am and finished it at 3:40am. 2 hours and 50 minutes of non-stop reading on the airplane on my way to work one night. It was a fun and easy book to read. I really liked the character and will definitely be reading more of these books. Bowen writes the Molly Murphy books that I have been reading this year. But I think I like this protagonist even better! She is a minor member of the royal family during the 1930's, has no money and is trying to get jobs all the time, but can't really work because of the embarrassment it would cause to the family. This book was the first in the series and she gets involved in a murder mystery where she and her brother are the prime suspects. Still reading the Sookie Stackhouse books and the Molly Murphy books. I only have a couple more til I am done with these series and then I just have to wait for the authors to write more!! And as I said, I am also trying a new series by Rhys Bowen with ties to the royals and enjoying it immensely. I tried to start the Shakespeare ones by Charlaine Harris, but didn't really enjoy them that much, so I am giving them a pass. The Three Miss Margarets was another southern/race relations type novel. So again, if you liked The Help or Dry Grass of August (which I read last month), you might like this one too. A scandal in a southern town. And secrets that go back to the 1960's. Dirty Little Secrets is a YA novel about hoarding from the point of view of the children who live with the hoarders. This is a pretty disturbing book. I am still not too sure how I feel about the way the author resolved this one. It sends a message that I don't like. The parts about hoarding and the stigma that the kids feel is great. But the conflict resolution was not to my liking. There is the prerequisite "cute guy at school and does he really like me" subplot for YA girls. The Hare with the Amber Eyes is the story of the Ephrussis family. They were a major banking family in Vienna, that was torn apart by Hitler's Nazi Anschluss. Mr. de Waal traces his family history thru a set of netsuke that were handed down over the years, the only thing left from a huge fortune and collection of artwork. Operation Mincemeat was a really cool story of an espionage plan during WWII. Spies created a false identity for a dead man and planted him with decoy papers to fool the Germans. Much like the person that Cary Grant is mistaken for in North by Northwest. A phantom agent!! A fun book about the espionage business during WWII. True Story, Lots of photos etc. A Bullet for Cinderella is another John D. MacDonald thriller. This book was only 160 pages and I read it super fast. Husband by Dean Koontz is another thriller, not spooky like some of Koontz's stuff. But a real page turner! much like the thrillers by Harlen Coben or Linwood Barclay. I read Husband on a single airplane ride when Ryan and I were traveling to the Terrapin Event in Massachusetts, but I did not clock my actual time reading for that one, less than 4 hours definitely. Dragon Bones by Lisa See is a murder mystery set in China, you might be more familiar with books like Snow Flower and the Secret Fan or Shanghai Girls by Lisa See. This is a more modern take on China and a good mystery. This is the second in the series. Room by Emma Donoghue was intense, but I really enjoyed it. A "ripped from the headlines" story similar to the Jaycee Dugard kidnapping, this book is told from the point of view of a child who was born in captivity. He and his mom escape and what happens next. Again, I didn't clock this one, but it was read in less than 4 hours. Gap Year was a good read. The story of a single mom and her teenage daughter who is about to leave the nest. It was told by the two different points of view in alternating chapters. I think that is what I really enjoyed about it, seeing the same story from two different voices. Cat O'Nine Tales is a collection of short stories by Jeffery Archer. When he was in prison he heard all kinds of tales of mischief and mayhem and he put them down in this book with the names changed to protect the innocent and the not-so-Innocent. Fun and enjoyable read. Speaking with the Angel is also a collection of short stories, compiled by Nick Hornby of About A Boy and High Fidelity fame. Proceeds from the sales of this book go to help fund a school for autistic children. Nick Hornby has an autistic son, who knew?? Anyway, a great collection of authors from Helen Fielding of Bridget Jones fame to Roddy Doyle of The Commitments fame! Even Colin Firth (Mr. Darcy himself!) contributes a story. Another fun and enjoyable read. The book by Albert Jack, was just a bunch of stories investigating mysteries, urban legends? and oddities of the world. An easy and fun read, I was familiar with most of the stories already...like the Bermuda Triangle and D. B. Cooper, but I had no idea that band leader, Glenn Miller had disappeared mysteriously?! And there were questions surrounding Edgar Allan Poe's death?? I had no idea. Well, now I know! Murder in the Adirondacks: I loved it, but then I am fascinated with the Gillette murder case. This murder was the basis for Theodore Dreiser's American Tragedy (awesome book!) and the movie, A Place in the Sun with Montgomery Cliff and Elizabeth Taylor. This book is a report on the true story of what happened at Big Moose Lake in Upstate New York. A Northern Light by Jennifer Donnelly is another look at this murder for the YA crowd. The Secret History of the Pink Carnation is a romance novel/historical fantasy with story lines in present day and Napoleon's time. I enjoyed it and will read the rest of the books in this series. A lot like "Possession" by Byatt. Or if you liked Winter Sea or the Outlander books, you might like this one too. It concerns a girl researching the Pink Carnation (like the Scarlet Pimpernel) for her dissertation. The letters and documents she reads lead to the Napoleonic storyline about the Pink Carnation who is a spy in Napoleon's French Court and is set on bringing down Napoleon and restoring and/or avenging the monarchy. The Borrower was WONDERFUL, I think my favorite book I read this month. I read it in less than 2 hours, just tore through it! Could not put it down. It is about a Children's Librarian who gets involved with a boy who visits her library. She thinks he is being abused by his family and she ends up kidnapping him away from them. Would make a great book club selection because there is so much to talk about. How can you step into someone else's life and help them? What if you are the one who is wrong...censorship, the role of libraries and the freedom of information. Just tons of topics. AND it is funny and interesting and you just have to love the characters. Royal Pain and Royal Flush are the further adventures of Lady Victoria Georgiana Charlotte Eugenie of Glen Garry and Rannoch, 34th in line to the throne of England. Great fun and I read Royal Flush on the way to Scotland and much of the action takes place in and around Balmoral, so that was fun. Alice Bliss by Laura Harrington is about a young girl who is growing up and her father is deployed to Iraq. How it affects her and her family, especially since she has had such a close relationship with her father and misses him so much. Lots of YA type storyline, such as her first kiss etc. Ruth Fielding at Cameron Hall is a girls series book written by Mildred Wirt, who also wrote many of the Nancy Drew series. In the Ruth Fielding series, Ruth unlike Nancy Drew, grows up and ages throughout the series. In this particular volume, she decides that she does love her childhood sweetheart and they are to be married. The action part of the book is a bank robbery and Ruth's honey has mysteriously disappeared and is one of the prime suspects, so she must clear his name. This run of Agatha Christie novels are part of the Tommy and Tuppence series. Miss Christie's lesser known detectives after Miss Marple and Hercule Poirot. They are my favorites and I love revisiting them every couple of years. I have no problem rereading mystery novels. Often I will have forgotten key details. Things will seem familiar and I will have a nagging feeling that I know whodunit, but sometimes I am way off base. And Tommy and Tuppence are such fun characters, I know them so well and I like them so much that I really enjoy reading about them again and again. It is like looking through a family scrapbook. You have seen the photos before and you probably were even there when they were taken, but you still like to look at them and be reminded of those times! Rereading favorite books is like that for me. 26 books read this month! and make a donation. We need your help to keep Washington's Trails open and hike-able!! Christie's the Tommy and Tuppence series is really great! I do like N or M? Read it twice. But The Secret Adversary is my favorite among them. What do you think of this book? If i'm not mistaken, it's the first in the series. I have a number of the books that you read requested at the library will be on the lookout for some at used book stores. Your descriptions have been great. I love reading your updates! Your lists and reviews keep me adding more and more books to my "to-read" list. I started keeping track of the books I've read this year, also. I'm using www.goodreads.com. You are amazing! love the tidbits and your reviews. But, I have known you long enough that you should know that you hold a special spot in my heart. I hope one day to create a book of the postcards you are sent me over our 30 some years of friendship. Thank you for sharing your creativeness with me and so many people.